Each year in the United States, hundreds of religious buildings and schools become vacant or underutilized as congregations and populations merge, move, or diminish. These structures are often well located, attractive, eligible for tax credits, and available for redevelopment. In this practical and innovative handbook, authors Simons, DeWine, and Ledebur have compiled a step-by-step guide to finding sustainable new uses for vacant structures. The reuse of these important buildings offers those charged with revitalizing them an opportunity to capture their embodied energy, preserve local beloved landmarks, and boost sustainability. Rehabbing presents an opportunity for developers to recoup some value from these assets. Neighbors and other stakeholders also enjoy benefits as the historic structures are retained and the urban fabric of communities is preserved. 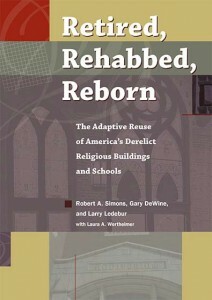 Retired, Rehabbed, Reborn features ten in-depth case studies of adaptive reuse outcomes for religious buildings and public schools that have achieved varying degrees of success. 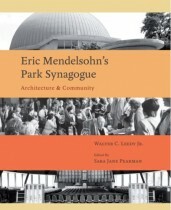 Several case vignettes appear within various chapters to illustrate specific points. The book is a useful tool for architects, planners, developers, and others interested in reusing these important structures. In addition to covering the demographics of demand and supply for historic buildings, the authors demonstrate how to identify a worthy project and how to determine a building’s highest and best use, its market potential, and its financial feasibility, including costs and public subsidies. Finally, they address the planning process and how to time the redevelopment and repurposing of these venerable buildings. Simons, DeWine, and Ledebur explain that while each rehab deal is unique and tricky—especially for prominent community structures that hold significant nostalgic and historical value to community stakeholders—there are identifiable patterns of successful and unsuccessful approaches, patterns that are addressed in turn throughout the redevelopment process. As the nation moves toward a mind-set and practice of recycling, reusing, and repurposing, this unique exploration of how that applies to buildings is an essential guide for anyone interested in being part of the process as communities develop and change. AuthorsRobert A. (Roby) Simons is a professor of urban planning and real estate development at the Levin College of Urban Affairs at Cleveland State University. He was a Fulbright Scholar in South Africa and has published more than 65 articles and three other real estate books. He also has an active consulting practice. Gary DeWine is a retired urban planner and community development specialist for the City of Euclid, Ohio. Larry Ledebur is a retired professor of economic development and spent much of his career at the Levin College of Urban Affairs at Cleveland State University.